Good morning. Are you off and running this morning? Did you all enjoy gathering with friends and family for the Super Bowl? We were actually at a volleyball tournament and an away hockey game so we crashed on the sofa and enjoyed together time as a family. Love any excuse to make yummy snacks and lounge in my sweat pants. Not at all prepared for the week to start but it appears we have no choice! Let’s do this. Here is our Monday Morning Wrap-Up. I shared these on stories but wanted to let you know about these sweet lemon trees. Our front porch is a bit tricky and I can’t keep anything alive. 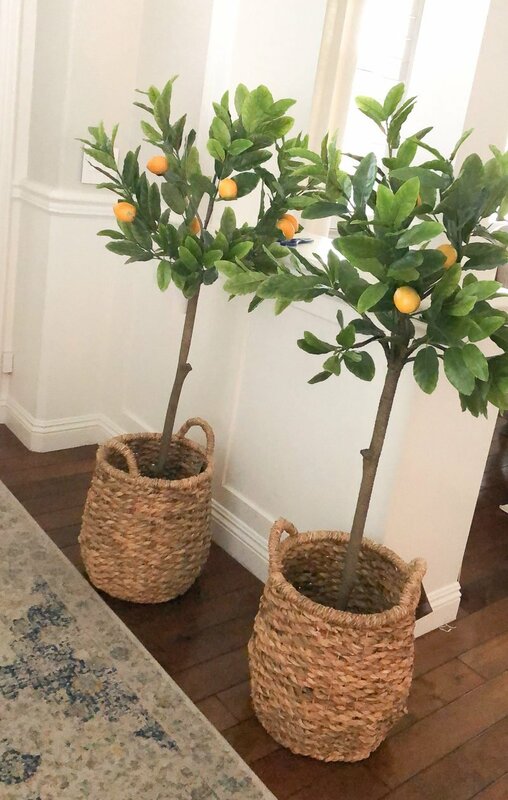 Rather than waste more money on trees and plants we can’t get to thrive, I bought these cheery faux lemon trees to place on either side of our door. They were 50% off at Hobby Lobby making them $60 each. The baskets are from World Market (also on sale) and we filled them with rocks from Home Depot. I’ll share a photo once all of the rain stops. They make me smile every time I see them. In an effort to keep with our healthy eating trend, we had to get a bit creative with the Super Bowl. My son requested a nacho bar. 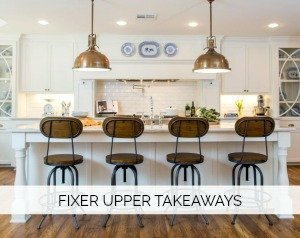 We were actually inspired after watching an episode of Beat Bobby Flay. We had chips, queso, chicken, avocado, and all of the nacho fixings you can dream of. 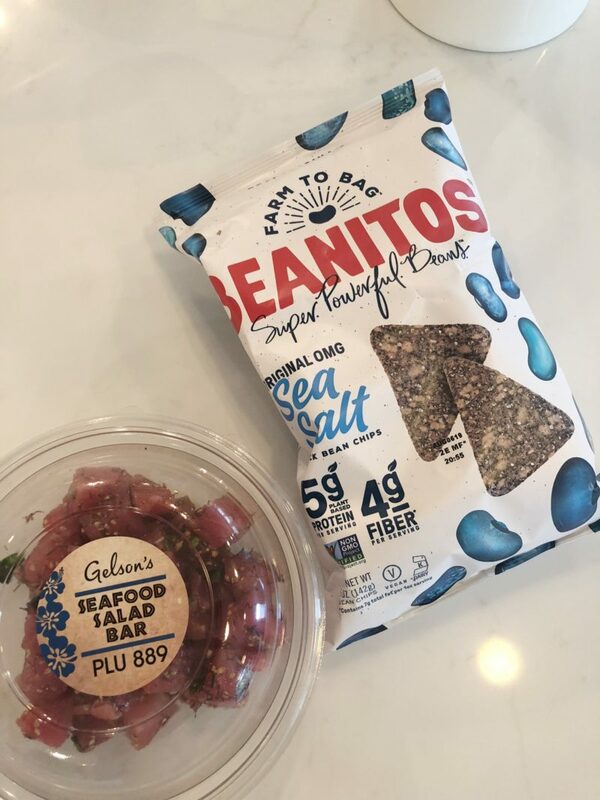 My husband and I went the ahi route and I wanted to share these chips. They are gluten-free and a great alternative when you want the crunch. I picked these up at Gelson’s but would imagine you can find them at Whole Foods, too. 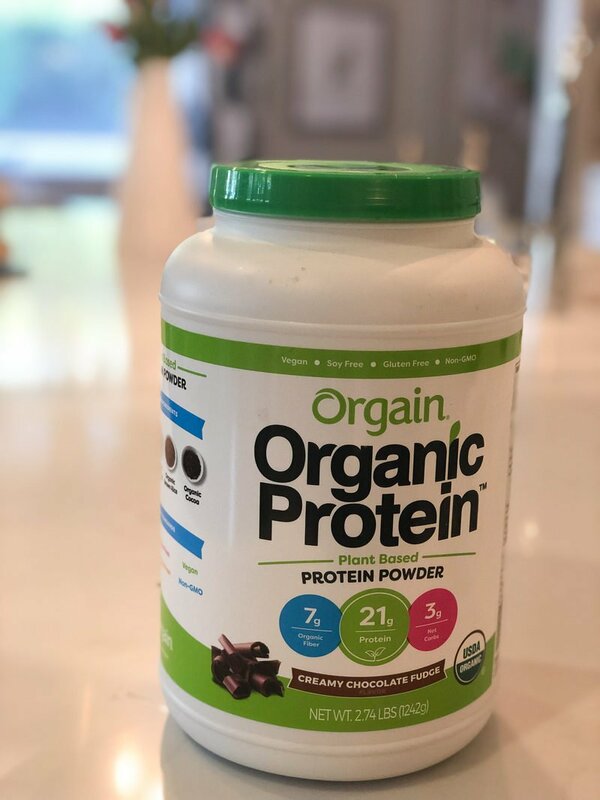 Many of you asked about my protein shake after I wrote about it in my health routine post. This is what I buy from Costco. I add two scoops to about 10 oz of almond milk. Then I add half a banana and a handful of spinach. Super yummy. My friend Sarah, who I met because of my mom’s disease, wrote this incredible book. 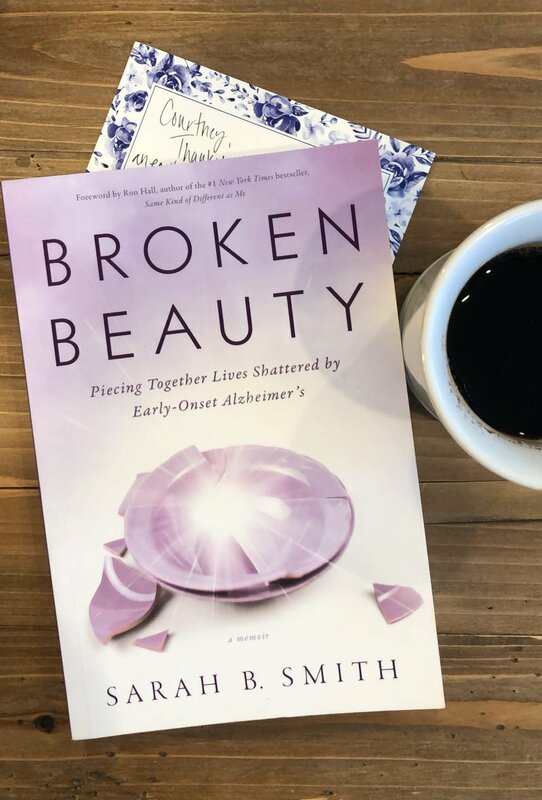 Broken Beauty is now available on Amazon. Her strong faith weaves throughout the book and tells the story of her learning to accept her mother’s early onset. Her mom and mine share so many similarities it was like reading my own story. If you want to learn more about Alzheimer’s or if you have a friend who could use this book, I highly recommend it. So proud of you, Sarah. Local mamas know that we have been inundated with rain. And we are in for more this week. So what do you do when you can’t go outside . 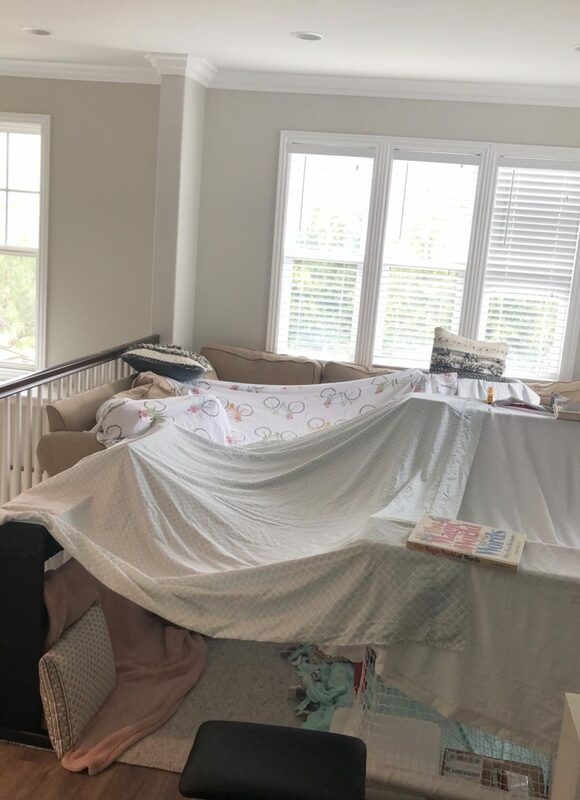 . . you build a fort. The kids did this all on their own and I was cracking up when they told me it has two bedrooms and a community center. This is what childhood is about. And you would be proud of me. I haven’t even asked them to take it down yet. It’s been a while since I’ve updated you on my sweet mama. I am now sharing on my new Instagram called @love_and_openarms. 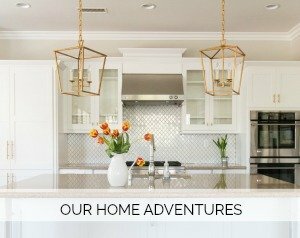 You are welcome to check in with us over there. Mom is struggling right now. It’s been a challenging month. We aren’t seeing the sparkle and she appears more confused for the majority of the day. We are working very closely with her doctors and caregivers to try to pinpoint anything that might help. It’s frustrating because I just want to make it better for her and I don’t want to accept that this could just be the progression of the disease. Sweet mama deserves more. Those of you going through this, my heart is with you. I understand. As I type this, more rain is coming down. It makes the hills so green and I absolutely love it. Time to fit in a good workout and then tackle the day. Make it a great Monday, friends. Hope they have checked for a urinary tract infection on her. For some reason,, bladder infections can send the oldies right over the moon! I know it’s so hard to watch the decline. Have been thru it at the same time with both parents…so,I know exactly how you feel. Hang in there sweetie. Hi Colleen. Thank you for taking a moment to comment. Yes. She did in fact have a horrible UTI a few weeks ago. So difficult when they can’t communicate discomfort or pain. I can’t believe you went through this with both parents. You are a strong warrior. Thank you again and have a really lovely week. I haven’t read Broken Beauty but I did read Still Alice. It was a real eye opener in that she was so young. My mom had dementia. It’s a terrible disease that takes your beloved mom long before she’s gone. My heart goes out to you. Hi Joanna. I am so sorry you experienced dementia with your mom. It truly is an awful thing to experience. I haven’t had the courage to read Still Alice but I know I should. Thank you for the reminder. Have a wonderful week.